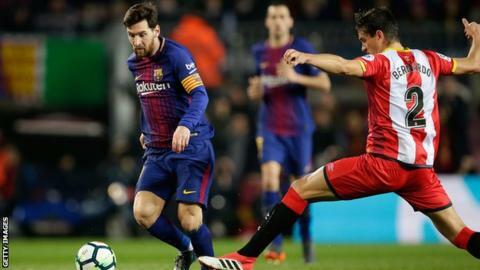 Barcelona, Girona and La Liga have asked the Spanish Football Federation for permission for the two Catalan clubs to relocate a match to the US. The game, Girona's 'home' match, would be held at Miami's Hard Rock Stadium on 26 January at 19:45 GMT. A compensation package for Girona season ticket holders has been agreed. RFEF, the US Soccer Federation, Uefa and Concacaf need to give permission for the game to go ahead. Luis Rubiales, the president of the RFEF, has previously spoken out against the US game. The Spanish players' union (AFE) has also opposed the match and following a meeting with La Liga on Monday, it said the players would have the "final say". La Liga, Spain's top flight, has agreed to play one game a season in the US as part of a 15-year deal with media company Relevent. Girona is in Catalonia, about 60 miles north east of Barcelona. The club say the match represents a chance for expansion and growth, both for the club and the region. La Liga is planning to subsidise travel and accommodation for fans affected by the relocated match. For Girona season ticket holders, there will be 1,500 free flights to Miami, with a choice of staying overnight for the weekend, or coming straight back after the match. For those who do not want to travel, there will be 5,000 free tickets to the away game against Barcelona at the Nou Camp on 23 September and 20% off their season ticket. Fans who cannot do either would get a 40% discount on their season ticket.